An early fundraising breakfast makes for an early bike ride. The morning was cool and overcast and the forecast suggested the possibility of some liquid sunshine later, so I took my rain skirt and rain jacket along in case I needed them. As with Tuesday’s ride in Olympia, though — and as is often the case this time of year — a light jacket was plenty (especially with a ride of 10+ miles right off the bat). The occasion for today’s early start: the Mountains to Sound Greenway breakfast, with former Secretary of the Interior and REI CEO Sally Jewell as the keynote speaker and a celebration of the Greenway being named a National Heritage Area by an act of Congress. So inspiring to start the day with her moving tribute to the visionaries who saved this huge natural space, put together partnerships, restored watersheds, built trails, and more to make it available just a bus trip away from downtown Seattle (thanks to King County Metro’s Trailhead Direct program, a great way to enable more people to get there while reducing vehicle emissions). There’s a spot along the Duwamish Trail I often stop at for a quick picture to illustrate my ride to town, a handy little pull-out with a picnic bench. I can see the river passing by, and upriver the cranes that mark the industrial use of what once was free-flowing water where people gathered, fished and paddled. I mark the passage of the seasons through this corridor by the changes in the plants, the blossoms and leaves, how much of the sky I can see, the certain slant of light. This morning Canada geese called at me from across the river as I got rolling again. If you look closely you can see the geese across the river, near the far bank. At the breakfast I had a pleasant conversation with the gentleman seated next to me, who said he has a really nice road bike in his garage that hasn’t seen the pavement for probably a decade or so. Every time he thinks about getting out to ride, he realizes the bike really needs to get a trip to the shop for overall servicing. I suggested he just do that first step, so then the next time the idea of riding passes through his mind, at least that barrier will be gone. I think he may be heading to a bike shop this weekend. This led naturally to a remark I often make: I’d almost rather ride in rain than in wind. Rain is dampness and you can block that with good gear, but wind is work. Be careful what you say when you’re inside a building and don’t know what the weather has in store for you when you come outside. I came out of the breakfast to find that indeed, I had some work facing me on the way back to the office. And a little of that “veggie mister” extra moisture that seems to be a Seattle specialty — not really rain, and not really not rain. Rain skirt/rain jacket went on but I don’t think I really needed them. This windy work was where the e-bike showed another benefit of that little extra boost: Pedaling straight into a strong headwind, I could still maintain a reasonable pace in what otherwise would have been a pretty grueling corridor. I was in a hurry to get to the office for a meeting and with Zelda helping overcome the pushback from the wind I made it in less time than I would have if I were powered only by breakfast. Despite this reminder about the importance of keeping your weather eye open, the day was packed so full that it wasn’t until I went to load the bike in the evening that I really looked at what was happening outside for riding conditions. Once again it looked gray and overcast but not actually raining. Sure enough, though, when I came outside and got out of Pioneer Square and onto the trail headed south there it was again: those straight-on stiff headwinds. Work, work, work. I’d already been glad to have the e-bike help awaiting me since I was leaving the office a full 12 hours after I left home in the morning. 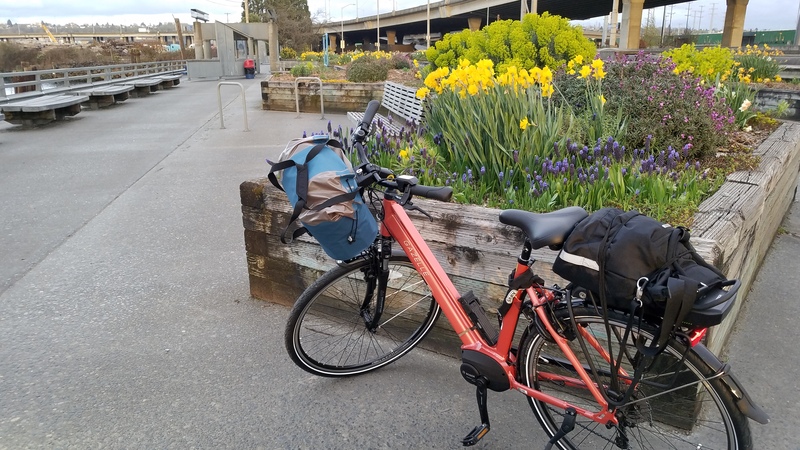 But I was even more glad to have that little assist as I pedaled straight into the wind with my scarf whipping about my neck for over 9 miles, with one little stop for a photo because I couldn’t resist the flowers in bloom. I’m certainly not aerodynamic on an upright bike with a big bag on the front no matter what the air is doing around me, but I can keep heading into the wind with Zelda’s help.